Die Ämbter Trittow, Reinbeeck, Tremsbüttel Und Steinhorst. Ao 1649. Old coloured map of Oldeslohe, Hamburg, Holstein. Printed in Husum by Petersen in 1652. Beautiful old coloured map of Hamburg and surrounding from Matthias and Claus Petersen after Johannes Mejer. Covering the area between Hamburg and Lübeck. With detailed plan of Oldeslohe and one coloured cartouche. From Caspar Danckwerth's Atlas "Newe Landesbeschreibung Der Zwey Hertzogthümer Schleswich und Holstein". Plate later acquired by Blaeu and used in his "Atlas Major". Title Die Ämbter Trittow, Reinbeeck, Tremsbüttel Und Steinhorst. Ao 1649. Some overall browning, magins backed. Johannes Mejer, a geographer and mathematician, was born 1606 in Husum. He has mapped Schleswig and Holstein in the years 1638 to 1648. The resulting maps have been published in Danckwerth's Atlas Newe Landesbeschreibung der zwey Hertzogthümer Schleswich und Holstein in 1652. 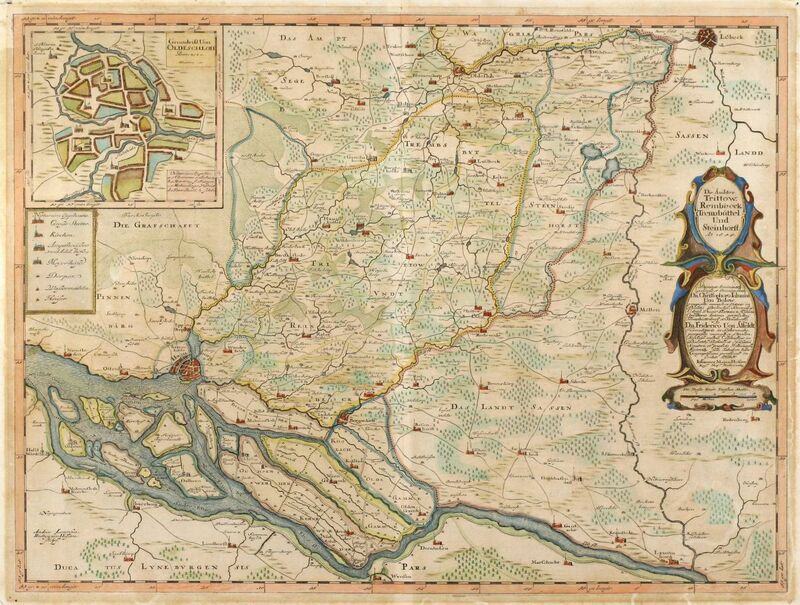 The copper plates were sold to J. Blaeu and re-published in his Atlas Major. Mejer died in 1674. Johannes Mejer: Die Ämbter Trittow, Reinbeeck, Tremsbüttel Und Steinhorst. Ao 1649..